World Population Study shows: Fingerprint in Pointer Finger is most unique! Every person has unique fingerprint. In the forensic sciences the process of comparing two fingerprints – known as ‘dactyloscopy‘ – is focussed on identifying tiny characteristics in the friction ridge skin. However, fingerprint pattern types are not unique at all: they e.g. 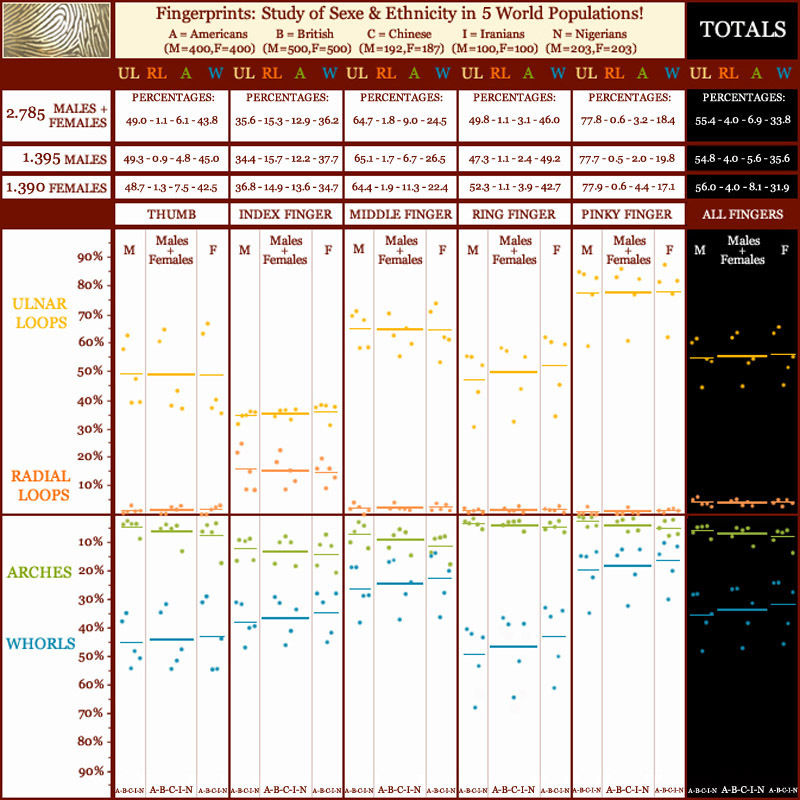 fingerprint pattern types highly depend on sexe & race. An international study points out that the fingerprint type in the pointer finger is most unique! In order to study the interactive effects of sexe & race in fingerprints (dermatoglyphics), a study has been conducted on fingerprint samples in 5 world populations (2.785 people) – including: Americans (A), British (B), Chinese (C), Iranians (I), and Nigerians (N). – arches are characterised by the absense of a triradius. International studies in the past have shown that fingerprint types in females almost universally differ from males in having more arches. And usually females also differ in bearing fewer whorls, and typically they also tend to have slightly less radial loops. The new study shows that in all 5 populations arches are much more common in females: +44.9% (compared to males); and whorls are indeed less common in females: – 10.5% (compared to males). And as expected the sexe-effects in radial loops (-0.6%) and ulnar loops is much smaller (+2.3%). Interestingly, the most typical sexe-effect for arches is by far less prominent in the index finger: +11.5% (compared to the other fingers: thumb: +57.6%, middle finger: +69.4%, ring finger: +58.4%, pinky finger: +123.1%). This indicates that the fingerprint type in the index finger is least ruled by sexe. The Fingerprints World Map has shown that studies in the past have shown that the occurence of fingerprint types varies significantly in the populations around the world: e.g. Asians are known for a higher occurence of whorls, and Africans for a higher occurence of arches. – Arches are by far most common in Nigerian females (13.7%) and males (9.1%). Interestingly again, the details show that the most typical racial-effects are least prominent in the index finger – in the picture this is e.g. also indicated by the relatively small variance for the ulnar loops among the races! Summarizing, the study has shown that sexe & race have relatively small effects on the fingerprint type of the pointer finger. And this might actually makes sense, because the pointer finger [index finger] is known for displaying the highest level of variability – e.g. arches & radial loops are known for manifesting by far most often on the index finger (and the same is true for less common fingerprint types such as: the tented arches & accidentals). 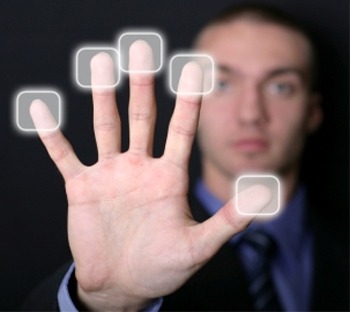 « FINGERTIP BIOMETRY – Fingertips Signal Clues for Schizophrenia!